We love Wonderworld Toys here at my house, we have the Eco House and the Wonderworld Cooking Centre which are gorgeous toys that are both in our living room and get a lot of play from our children and any visiting children. 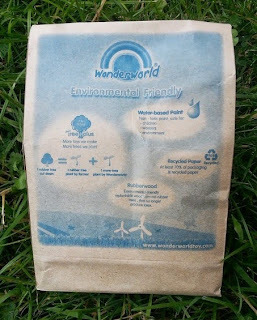 Wonderworld have a very strong ecological message, their toys and games are made with sustainably produced wood, recycled board and all promote ecology to children without preaching, but by normalising it. Wind and solar power, water conservation and growing your own food are all part of several of their toys. The Eco-House has recycling bins, and the Wonderworld Recycling Game is an excellent way to teach your children about which of the things from your household rubbish can be recycled. The game is suitable for 2-4 players and ideal for children aged 3+. 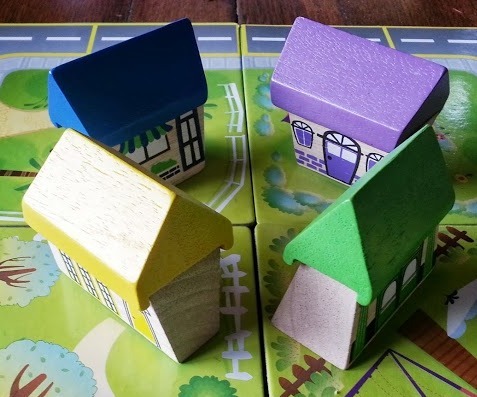 All of the game pieces are in 2 cute little paper bags, and they are beautifully made from wood. There are 4 gorgeous little 2 part houses, and 4 fantastic little recycling trucks which are actual wooden cars with real wheels. The game board is in 4 pieces and there are 20 counters representing household rubbish, and a larger than usual wooden dice. 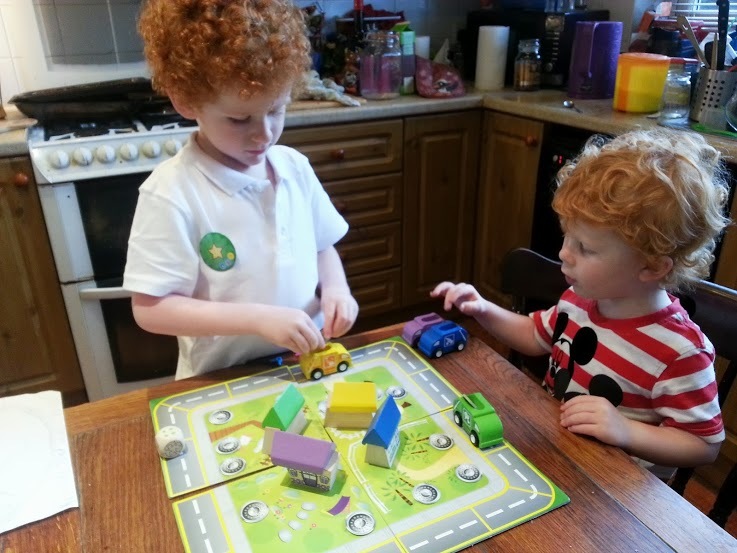 Gameplay is incredibly simple and very easy for the recommended age range of 3+ to grasp. 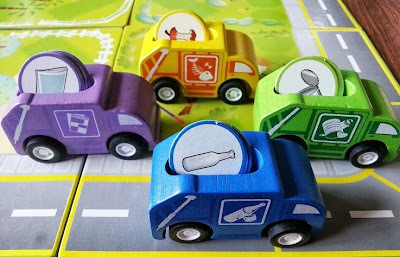 You simply drive your recycling truck around the board collecting all of the appropriate rubbish for your truck. Yellow for example collects compostable kitchen waste. You have to turn over a counter and if it's yours you can take it. The Wonderworld Recycling Memo game is great for teaching turn-taking and really promotes memory skills and concentration as the players have to watch which counters are turned over by other players and remember where they were, so that the next time they park there in their truck they can pick them up or choose a different card accordingly. 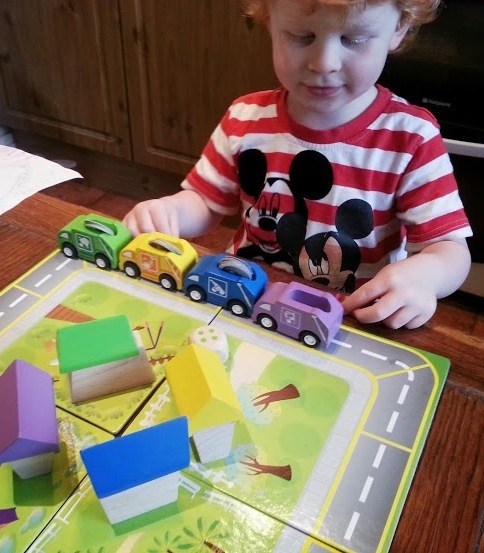 This game is ideal for early numeracy skills. Dice games are always great for helping to teach young children to count and aren't intimidating as it only goes up to 6. This is a rapid and fun game, with lots of 'ooooh' and 'aaaaargh' moments. It's perfect for children to play together or with adults. One of my favourite things about this game is that it doesn't have to be a game, it can be a plaything. 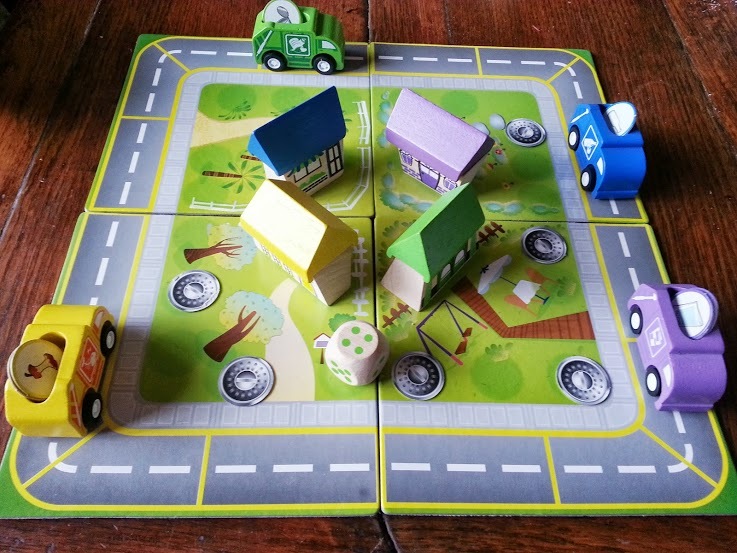 My 3 year old adores the little cars and has spent far more time playing with them, driving them around the board and parking them at the little houses, than he has spent playing the actual game. I love that he gets such a lot of enjoyment from something which would usually only be useful during the game, and even if your game had 3D cars they'd likely be flimsy plastic and you'd worry that they would be broken. This is a really nice product. As a game I think it's okay, and my boys love it. As a toy it really fits the bill, and as an overall beautiful thing it's just lovely. It is currently available from The Toadstool online toy shop for £19.50. This is not a cheap game, but it is really well made, sustainably sourced, fairly traded. It's a beautiful game and although you may have to replace some of the cardboard counters over time, the cars and houses will last for far longer than you will need them. I was sent The Recycling Memo Game to review as part of my role as a Toadstool Toy Tester. It is, it's mad to be able to let your children play with the playing pieces! 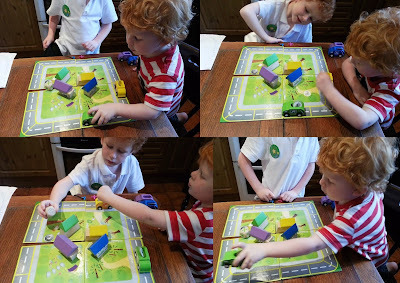 This looks like fun - different from a lot of other board games! 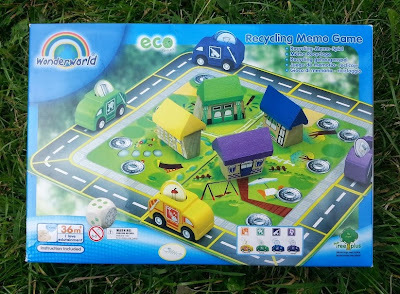 Oh, my little man would love this game, he is very interested in recycling. We have a different brand's game What's rubbish, along the same lines. I love the pieces, I think Bud would enjoy playing with them separately to playing the game too! I would like to print more counters. Do you know where I can find them? Hiya Sunshine, I've looked on the website and Wonderworld don't seem to do the Recycling Game any more, but you could email to ask if they have spares/replacements info@wonderworldtoy.com If you don't have any luck that way then I suppose you can print off anything which seems appropriate in the right size, even photographs or your own drawings.